Hello Adventurers! 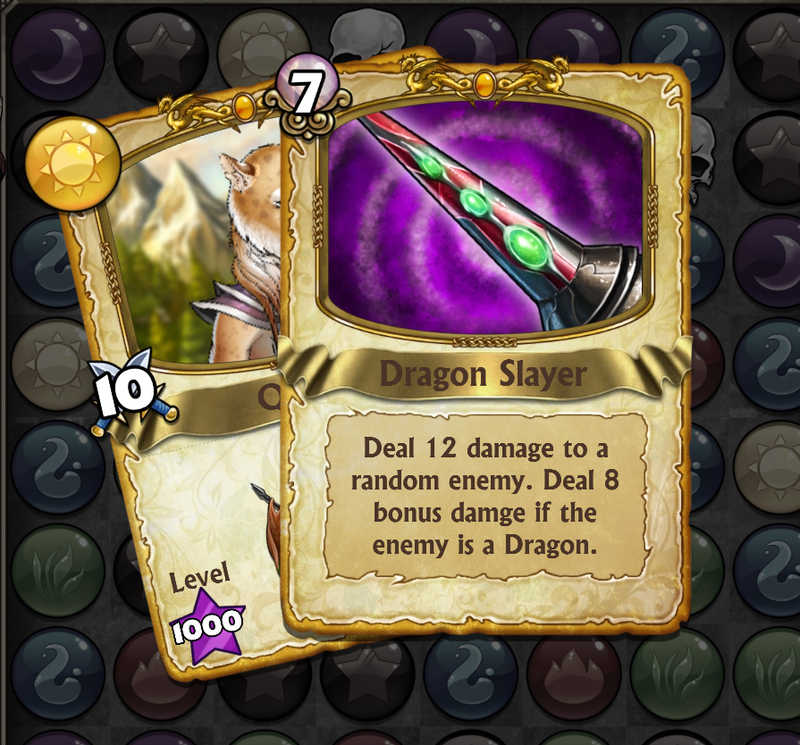 It’s open season on Dragons this week in Sword’s Edge, with a new weapon, Order & Chaos – a pair of Throwing Axes that are particularly good at dissecting, dismembering, and generally disrespecting Dragons hiding in the last two positions of an opposing line-up. To make things fair for the Dragons though, we’ve given the Shadow Dragon a little bit of shadowy love with a rework of her spell. Onwards! Rumours have been swirling about mighty weapons that could help Krystara’s heroes fight back against the Dragon menace, and one such weapon has surfaced! 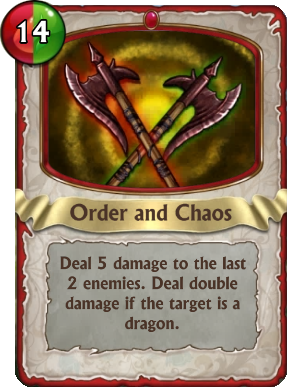 With an axe in each hand, Order and Chaos empowers heroes to deliver whopping damage to a Dragon, and delivering solid blows to anyone else who might be occupying the last two spots. Perhaps it’s time to reshuffle your troop positions? Heroes have also worked out how to harness the magic that surrounds Order and Chaos and the Dragon Slayer has received its own boost. It’ll now deliver bonus damage against Dragons! In an effort to fight the raw power of these Dragon killing weapons, the Shadow Dragon has forgone its Poison ability to deliver maximum damage to anything that might threaten its kind. Don’t expect any level of armour to hold off its boosted ability. Ever wondered what a battle would be like if the Goblin King could summon minions? Well you’re about to find out! Will this eventually lead to a spin off game that focuses on the day to day politics of a Goblin empire, and berates you when you cut funding to Goblin schools? Probably not, as the Goblin education system is famous for being non-existent. * Rank 15: 0 Souls, and the tell-all autobiography ‘How Gems of War Cost Me My Job Productivity’ by anon. Update: We forgot to include this but a few of you picked it up. The Hobgoblin Mana cost has been increased from 9 to 11 in order to bring his casting rate a bit more in-line with the amount of damage he can deal with his extra turn ability. 25 Comments ON " Dragon Season "
Does the goblin summoned require that you have an empty space open for a card? 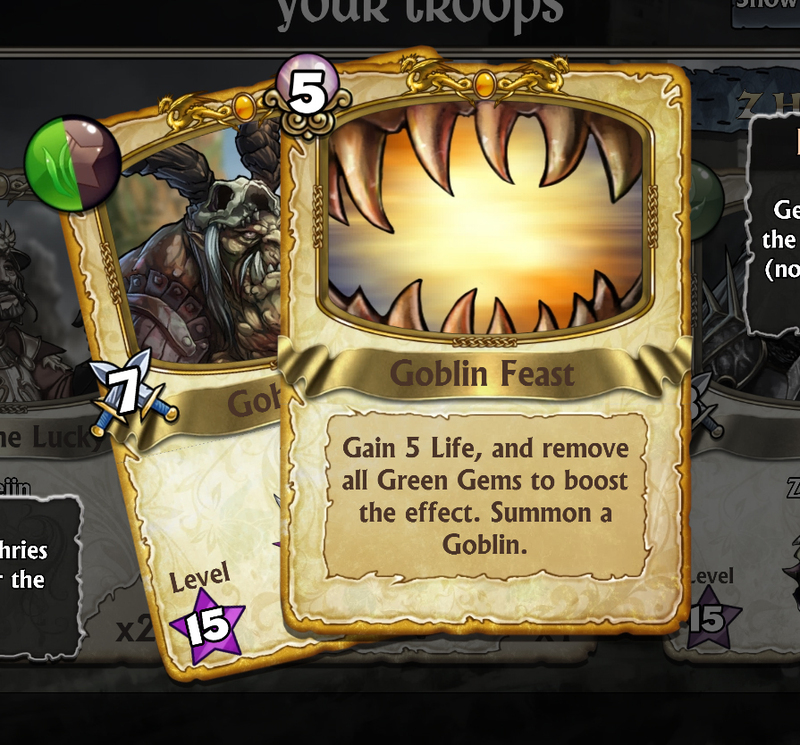 It would be great if the goblin started with full mana after being summoned; otherwise, I feel like this ability isn’t really useful because it’s one more card to compete with Green mana on top of having all green gems removed. Either the ability should boost goblin type cards magic by one or two, or buff the goblin cards that you’ve created with his ability after next use. thanks for totally wrecking the shadow dragon and the great team that ive had planned to use with him. worsted so called buff ever. he was just fine the way he was. the poison is what made him the shadow dragon. Yeah, not thrilled about the Shadow Dragon change. Poison was already an iffy status effect, and Shadow Dragon was *the* best way to apply it. He had great synergy with himself and other true damage units. I’ll give the new version a shake though and see how it goes. Re: Goblin King. Interesting. I actually have a Goblin King that I might level now. I assume it requires an empty space though, making it kind of a reverse Black Beast (only useful on non-full teams, vs only useful on non-empty teams). Hey…now there’s a combo…Hmmm. 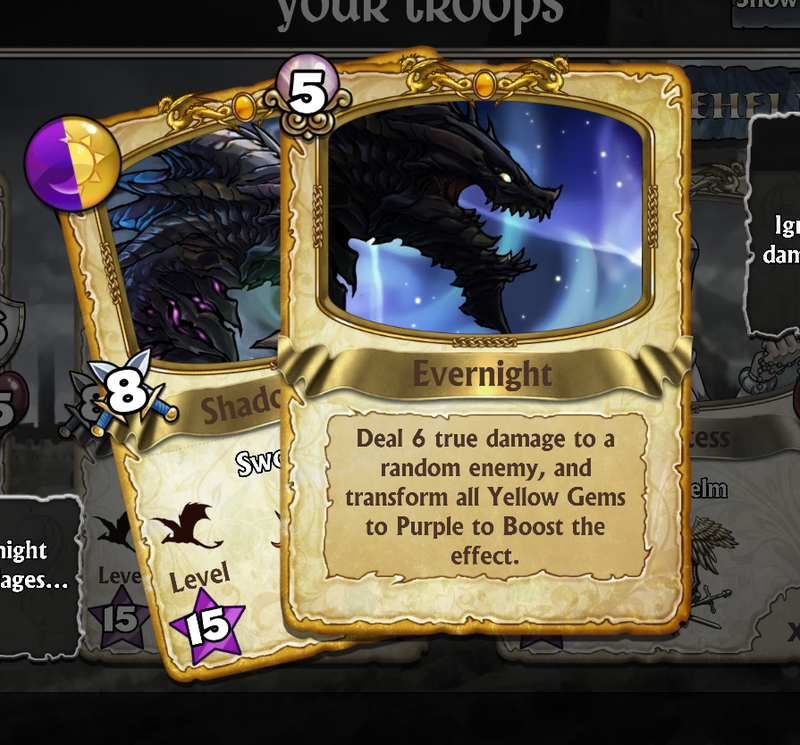 Also, the troop list says “Gain 5 life”, but the unit has a magic value listed that doesn’t appear to do anything. Is the text wrong, and it’s “Gain [magic] life”, or does magic not do anything for him now? The level of the summoned goblin is based on the Goblin King’s magic. Interesting. Is it level = magic * 3 then, since the magic tops out at 5? I can’t imagine it’s 1:1, since summoning a level 5 goblin would be pretty underwhelming. It’s actually 1:1, which is better than you might think in practice. We thought we’d start with it there, and then we can adjust upwards later if he feels a little underwhelming still. I’ll have to try it (if I can spare the souls to level him), but I suspect it will be underwhelming. On the one hand, yes, you’re summoning a whole new unit, which is a good effect. On the other hand, it costs 17 mana, and you get a unit with 5 HP and 2 armor. This will die in one hit to almost anything, and you can spend 14 mana (Alastair) to give all units about 7 more toughness, or 12 mana (Bullroarer) to give all units 5-6 more toughness. In other words, the Black Beast strategy seems doomed to failure – 30 overlapping mana (that gets removed from the board, too) for a small boost to one unit vs 25 mana (Luther + Bullroarer) for an essentially equivalent boost to all units. I guess my main problem is that you need to win the game, not just not lose, and gaining lots of life and summoning units with 3 attack and 2 magic doesn’t really help with that. There is an error with the new weapon: on the rewards screen it shows that it uses blue/purple but once you purchase it, it shows that it uses red/green. I can confirm this bug. I wouldn’t have bought this weapon if I knew it was green/ red and not purple/blue. Sorry about that – we have a blue/purple weapon coming in 2 weeks and the colors got switched around in the Shop Menu. We just deployed a hotfix for the problem. If you (or anyone who accidentally bought based on the color) contact support@gemsofwar.com, they’ll happily refund the Glory you spent and remove the weapon. Something old and something new awaits you this week. * A new weapon, Order and Chaos, will help with those pesky Dragons. * The Shadow Dragon has had a rework too. Check her out at gemsofwar.com. * The Goblin King has a new spell. He now summons Goblins! At frist I was surprised when I suddenly had a low Level Goblin in my Team (read the changes right after that). ANOTHER GOBLIN KING BUFF! COOL!! I really liked the him as a front Tank after the last Buff right before 1.06. And now he spawns a little Goblin! Exciting!! He is very situational now, definitely became worse for me. With such a bad effect you should now be able to choose the target. Like others have mentioned, I feel this is a huge nerf for the Shadow Dragon. -1 damage and removing poison? No bueno. I didn’t even realize it was nerfed until I started playing today. Completely threw off my team that I’ve been using for months. I added the goblin king, tried him out with my Zaejin army, filled his mania, casted a spell and NO GOBLIN. What am i missing? I figured it out. You have to have an army member die. hmmmmm…..
Kinda embarrassing to have to admit this, but who knows, maybe I’ll be doing someone a favor. I’ve been playing Gems of War since December 2nd, 2014 – and a [ ! ] ( Exclamation Mark ) would normally Pulse / Flash in the top right corner of the Defend Button – indicating you’ve been Invaded since the last time you clicked the Defend Button. I never noticed, nor remember reading anything about the change that was made in regards to that setup. Now, to indicate to the player that you have been invaded, the [ ! ] [ Exclamation Mark ] will appear over the Invade Button instead. After having noticed I’d gone so long without seeing the Indicator above the Defend Button, I clicked the Defend Button expecting to see that, yes, I had in fact not been attacked in such a long time frame ( for some reason ). Instead, I get the saddening message that I had a grand total of 30 Invades occur over that time frame that I wasn’t aware of. This was highly unfortunate, due to not only being able to Store / Hold 3 Defense Sieges at a time, but also because after a certain amount of Victories, you earn Bonus Rewards – and eventually the 0/60 counter will reach its max, and reset to 0, further opening the window for more rewards. It’s never fun to miss out on an opportunity because you didn’t know about it. [ However – I’m not sure if it costs just as much Gold to Defend as it does to Invade, or if you get as much Gold Rewarded to you through a [ Defense Victory / Defense Loss ] as you would see in a [ Invade Victory / Invade Loss ]. So, for those of you like me, who have been looking to the heavens for a sign that it’s time to Defend your current Kingdom, I’m here to pat you on the shoulder, turn you around ever so slightly, and whisper in your ear – “Your looking in the wrong direction, my good sir or madam, but if you’ll kindly look over here in this direction, you’ll notice that, yes, you have in fact been invaded recently, and no, they won’t offer their souls and gold freely. Thank you so much for giving Shadow Dragon her prime feature back. Yay, back in the team – thanks to Jarl F for substituting, but you never really made it for me.